Results for the Interactive Track are now available! A lot of Ontology Matching systems have been developed over the last years. After several years of experience, the results can only be slightly improved in terms of the alignment quality (precision/recall resp. F-Measure). Based on this insight, it is clear that fully automatic ontology matching systems slowly reach an upper bound of the results they can achieve. By incorporating user interaction, we expect to improve the alignments even further and to push this upper boundary. Semi-automatic ontology matching approaches are quite promising since humans can really help the systems, for example by detecting incorrect correspondences. Whenever the user is directly involved, all required efforts of the human have taken into account and it has to be in an appropriate proportion to the result. Thus, beside the quality of the alignment, other measures like the number of interactions are interesting and meaningful to decide which matching system is best suitable for a certain matching task. By now, all OAEI tracks focus on fully automatic matching and semi-automatic matching is not evaluated although such systems already exist, e.g. LogMap2 (Jiménez-Ruiz et al., 2011) As long as the evaluation of such systems is not driven forward, it is hardly possible to systematically compare the quality of interactive matching approaches. With this new track, we like to change this unfavorable situation by explicitly offering a systematic, automated evaluation of matching systems with user interaction. For the first edition of the interactive track, we use the well-established OAEI Conference data set. This data set covers 16 ontologies describing the domain of conference organization. Over the last years, the quality of the generated alignments has been constantly increased but only to small amount (by a few percent). In 2012, the best system according to F-Measure (YAM++) achieves a value of 70% (Aguirre et al., 2012). This shows that there is significant room for improvement, which could be filled by interactive means. Moreover, the Conference set has a suitable size such that most of the systems can participate and do not run into problems concerning the run time or memory consumption. You do not need to include the Oracle-class in your system (as library) but then your system might indicate that the class cannot be found. However, when starting the client itself, the class should be loaded without problems. Aguirre, J. L., Eckert, K., Euzenat, J., & et al. (2012). 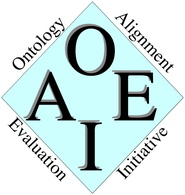 Results of the Ontology Alignment Evaluation Initiative 2012. Proceedings of the 7th Ontology Matching Workshop, (S. 73-115).